We are an organization committed to promoting peaceable conflict resolution and mediation. NHCRA works to support ADR professionals, and educates the public about mediation and other cooperative conflict resolution options available in New Hampshire. Don't miss out on educational opportunities. Check out our Calendar of Events for upcoming, informative workshops and gatherings. We are constantly developing relevant and innovative programs to serve both our members and the 1.3 million New Hampshire residents who can benefit from peaceable conflict resolution. Help improve your community by volunteering at NHCRA in some capacity. Whether you can contribute one hour a month or several, you can become an integral part of helping us accomplish our important mission. Serve on a committee, apply to join our Board or simply tell us how you'd like to help. You'd be surprised at what a huge difference a little bit of your time can make. Bookmark our Calendar of Events and check it regularly. NHCRA sponsors numerous educational workshops and social events for members, professionals and the general public each year. Join us at our next event and experience what is possible when dedicated volunteers apply their talent and imagination to a mission they believe in. Our workshops are often pre-approved for credit hours required for mediation, legal and other professional licensure. NHCRA is THE hub for all information related to peaceable conflict resolution. Find a mediator, a collaborative attorney, or one of the other professionals who are dedicated to helping people resolve conflict more amicably. Meet the dedicated volunteers who make up our leadership team. At NHCRA we understand that conflict is a normal and inescapable part of life. In fact, most change and growth comes as a result of conflict. We believe that determining whether conflict will be productive or destructive depends on how it is resolved. It is our goal to make cooperative conflict resolution processes like mediation, the first resort of people who find themselves in disagreement. 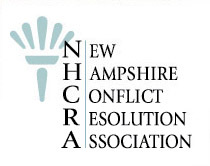 The New Hampshire Conflict Resolution Association (NHCRA) is a statewide non-profit organization, dedicated to promoting and enhancing the practice and public understanding of peaceable and effective conflict resolution. Learn more and get involved. NHCRA Presents: "What Family Mediators and Lawyers Need to Know About the New Tax Law"
NHCRA presents an important and timely training event regarding the new Federal Tax Law, and how it impacts New Hampshire families. Learn from our esteemed panel what you need to know regarding this new law.